Comparing Doctor Who with Star Trek: Class is Enterprise | Warped Factor - Words in the Key of Geek. Dr. Moo goes on and on and on wherever his heart may take him. I like Doctor Who. I like Star Trek. Why shouldn’t I compare them then? One of the things I was thinking about would be the “One We Don’t Talk About” series that both franchises have. For Doctor Who that would be the one-series-wonder Class and for Star Trek it’s the prequel series Enterprise. Both of them have a lot of comparisons that can be made, and it’s a shame then that the Doctor Who team didn’t look towards that other five decade old sci-fi show to see how not to do the fourth spin-off. Join me then as I look over five similarities between the two ultimately unsuccessful shows. Just listen to both shows’ opening theme music. Unlike prior instalments in their franchise, they both to use an already existing song. For Class this was Alex Clare’s “Up All Night” and for Enterprise it was “Faith in the Heart” by Russell Watson. Both shows have great-looking title sequences. Class has a psychedelic kaleidoscope of imagery from the series with lots of teasers about what is in store, while Enterprise takes us on a genuinely moving and inspiring whistle-stop tour of the development of mankind’s discovery and exploration over time, from your standard sailing boat up to the starships seen in the series. But the songs playing over both of these are tonally jarring to say the least. Both songs fit thematically with what the show it's intended to be about and both are proper earworms that you’ll catch yourself humming along to for the rest of the day. But they both take away some credibility from their respective series, especially since it’s one of the very first things about either show that you encounter. First impressions count, people! It gets worse when you realise that both Class and Enterprise have better possible theme music in them! Just go to the end credits, and you’re sorted. Complacency, specifically on the part of the production crew. The BBC released Class on an online only channel before broadcasting it on BBC1 in what can politely be termed the graveyard shift. They could’ve made up for it by bothering to promote it at all, but no. Then they wonder why the ratings were incredibly low. Did they just assume that the Doctor Who fans would watch it just because it’s set in the Whoniverse? Compare with Enterprise where the broadcasters UPN simply assumed it would draw the devoted Star Trek fans just because it was another Trek series. Okay, Trek was in a declining state of popularity following the misfires of Voyager (which is tremendously underrated btw, and has a perfect ending too) but it was still drawing a reasonable audience. By turning back time to the beginning, allowing a freedom from the increasingly complicated canon that had built up over the last decade, the idea was that it could recapture Roddenberry’s original vision of adventuring and exploring. Creators Berman and Braga were so confident that it would work that the show didn’t even have the words “Star Trek” in the title until late into its run. That says it all really. As in, nobody wanted to see the story that either series wanted to tell. Prior Doctor Who spinoffs knew what they were all about. 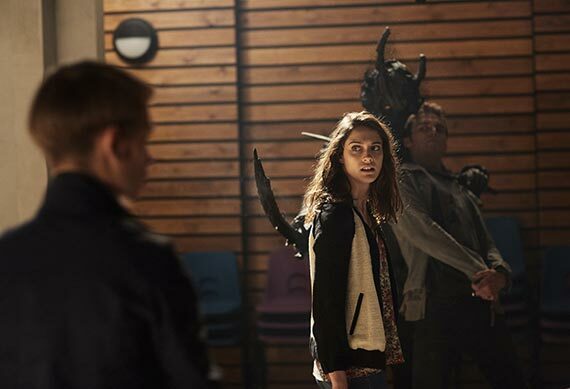 K9 and Company follows two former companions to the Doctor, The Sarah Jane Adventures picked up that story a long time later, Torchwood took a similar idea and went in another direction but it was still clear in its goals. Class couldn’t even be bothered to do that. It didn’t try to tell the story of a former companion, or even a one-off side character. It gave us some new characters, told us it was set in the same universe as Doctor Who, and left it at that. Because we didn’t know anything about these people we had no reason to get invested. (Even the Doctor himself doesn’t give a damn about them, considering the ridiculous difficulty of the task he’s giving to them it’s remarkable that he didn’t stick around.) But those of us who gave the show a chance were left disappointed. It frequently had me screaming at the screen to justify its own existence, but it never did. 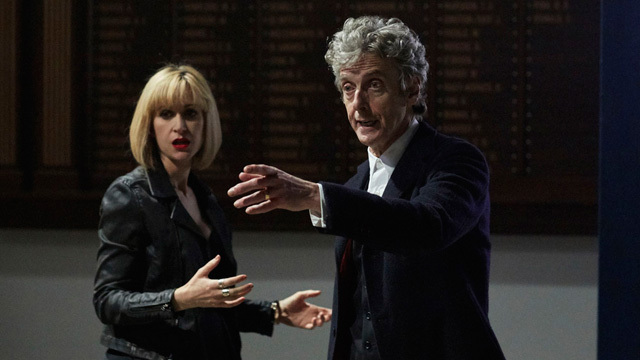 We don’t care about the students at Coal Hill School, I want to see Vastra & Jenny solving crimes, catch up with the SJA kids, see what life is like on Gallifrey, or any number of other things. Fans don’t give a toss about a bunch of school kids! Enterprise kind of had the opposite problem. While it wanted to be a prequel to the franchise, set after the second TNG movie First Contact, it ultimately delivered little on this. While it does indeed have that setting, the majority of the stories it tells across its episodes could’ve been told at any other point in the franchise. It even undermined this concept right there in the pilot (which is otherwise an amazing bit of Trek) by slapping the temporal cold war arc into it. By the third season Enterprise had found its feet, with the much more interesting and enjoyable Xindi, and in the fourth season we finally got to see the beginnings of the federation as we know it in TOS – but it was too late by then because though it was finally delivering on its USP it was past the point where that would be good enough. The general overview can be given in four short words: Too little too late. Neither show really has an excuse here because both have a generally good cast and intriguing characters, so neither should’ve been as disappointing in this area as they ultimately were. Class has six main characters who all offer something different and unique. Charlie, the alien prince from the planet Rhodia, and his prisoner Quill are probably the most interesting of the bunch but also worth mentioning are the surprisingly deep Ram and his blossoming relationship with April. Tanya is also awesome with her one-liners and hacking into UNIT. It’s such a shame that barely any of these people are actually nice. I personally don’t mind that, it makes it more interesting than the standard “good versus bad” storytelling, but this is a series where you need the characters to be nice people because there’s no tangible connection to the parent show. If we’re to get invested then they have to earn it. While they all do, it comes too late. Enterprise suffers in a different way. The characters are all well-rounded people but the writers rarely found much to do with them. Take Jonathan Archer, played by Scott Bakula, the first ever Star Fleet captain to command a ship. He’s totally out of his depth and clearly not cut out for this, making him different to Kirk, Picard, Sisko, Janeway... you get the idea. That should’ve made for a fascinating character arc but instead of looking at his faults we are constantly told how great Captain Archer is and his mistakes are never called out. I’d be prepared to forgive this if the writers found a good direction to take him in, but instead they decided to give up on the original idea of the character, it would seem, as they begin to push him into a prototype Captain Kirk. Bakula is good but this isn’t the right part for him to play and he clearly struggles as the series progresses in that direction. His co-stars don’t fare much better. Jolene Blalock isn’t able to do justice by her role of the Vulcan T’Pol, instead she's reduced to gratuitous sexualisation. She also ends up the focus of too many episodes (in spite of the series’s vision of seeing humanity, not the Vulcans, reach for the stars at last). Trip Tucker is interesting and very likable, think Han Solo with a spanner and you’re almost there, but he’s usually stuck away in engineering, and poor Connor Trineer is totally wasted. Dr Phlox is also an enjoyable character but John Billingsley doesn’t get to do much with him, relegated to the sickbay for most of every episode. 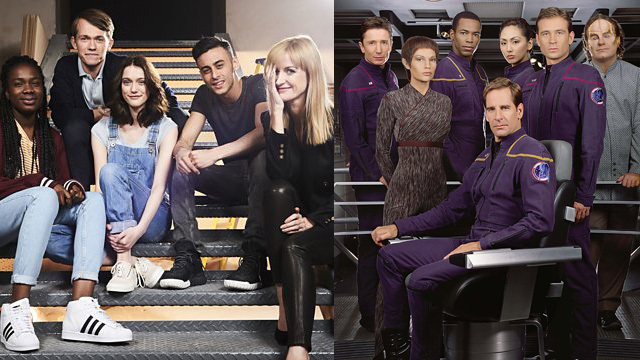 Both shows make the same mistake in different ways: The cast members are all there but not utilised as well as they could, and indeed should, have been. 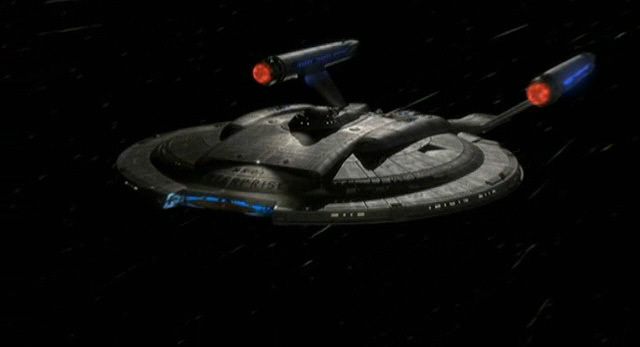 Enterprise had finally found its feet after a couple seasons of struggling. It was truly coming into its own during the third and fourth seasons, but then it was ended before it could capitalise on this newfound success. Just as it was getting good it was brought to an end, just before it reached the point where it could stand among the other Trek series' and prove it could hold its own against them, that was when it was given a premature death sentence! It’s a shame really, none of the other three Trek spinoffs found what they were trying to be until roughly the third season and all of them got to prove themselves as some of the best television out there when they got later in their respective runs, something Enterprise was robbed off the chance to do. Also, it’s so frustrating that they couldn’t end it properly. The finale is literally an episode of TNG! While seeing Troi and Riker return to Trek (still played by Sirtis and Frakes) is thrilling for fans it’s a kick in the teeth to those of us who stuck with Enterprise all the way through. That’s before I mention the fact that Trip Tucker is needlessly killed off in it, just to add some cheap shock value. One assumes that this would’ve been picked up on if a fifth season had been granted, but I guess we’ll never know. No unprecedented letter-writing campaign this time, sorry folks! 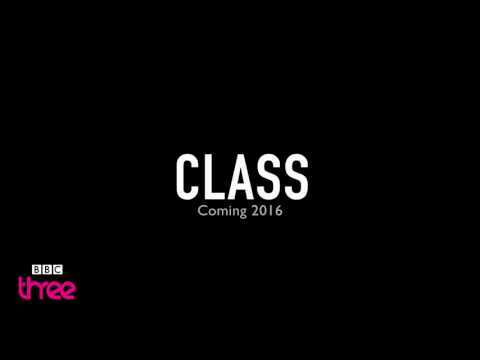 Class is a different story since it only ran for one season – my lawyers urge me to point out that we haven’t had any news of it actually being cancelled, but it certainly looks likely – and so we can only look over eight episodes (in contrast to ENT’s 98) but across those episodes we see a common theme: This is an uneven show. There’s potentially a really good series in there somewhere, with some interesting stories to tell in spite of the seemingly-limited setting. Torchwood proved that if a show is uneven in its first season then it could become good in the second and then an utter masterclass in the third, we’ll most likely never get to see if Class can do the same, but the fact that all the ingredients are there makes this all the more frustrating! The new monsters Class introduced are mostly a good selection of villains, and the stories the second season could tell, if it were to happen (though I’d bet money that it never does), could be very interesting too. But I guess we’ll never get to see it, those unfinished story threads (I count at least five) will forever be left hanging! I think the biggest reason both Class and Enterprise failed is not because of one single thing we can pinpoint. All of the five things I highlight above are factors. The fact that one cult sci-fi series made almost all the same mistakes that another did 15 years previously, and ended with a similar result, is shocking to contemplate. They say that history repeats itself and we have the proof of this here. With Doctor Who set to enter a new era after the next series finishes and with Star Trek’s latest spinoff Discovery just months away, let us hope both franchises can learn from the mistakes of their most recent spinoffs and see if the lessons have been learnt.